Firstly, congratulations for the publication of Prof. Kang's new book, "Artgeology and Chinese Painting"! This book's publication marks a new arts and scienceintercrossed branch --- Artgeology's birth. One word on the symposium's poster is "science and arts meet at the summit", I think it is very apt. Landscape painting is closely related to geology. From the view of geology, various stone features, geological structures, such as dislocations, rock bends, various geological phenomena have scientific law, scientific property, and respective natural and artistic esthetics. Chinese painting is an important component part of Chinese traditional culture, Chinese paintiong emphasizes extremely on "charm", the spirit-resonance, pays attension to mood. Teacher Kang, from both aspect, of the painting practice, his landscape paintings, of the research of landscape painting theory, exploring to the conjunction of scientific property and artistic property, has the experience of meeting at the summit. "Artgeology and Chinese Painting" is a very significant monograph, is a creative monograph, reflecting creative thought. First, warm congratulations to the publication of "Artgeology and Chinese Painting"! Second, this book is accomplished by more than 30 years' research of Prof. Kang, which is an perfect union of science and art. Natural science is human being's rarional contemplation over the nature, whereas, art is human being's perceptual comprehension over the nature. Prof. Kang combines science and art marvellously and perfectly, to form a new domain, Artgeology, in science, opening up a new Chinese painting theory in painting art, signifying initiatively. Hence, president Chen said ought to thank Prof. Kang for so many years his hard working! Third, geology intercrossing with art, wish there is no lack of successors, foster students, to acquire greater achievement. My words had been writen in "Artgeology and Chinese Painting - Preface", no need to repeat. (1)Artgeology is a pioneer branch, in China, maybe in the world as well. Uniting painting and geology into one entity, just like what written in the symposium's poster --- "science and arts meet at the summit". Artgeology's birth at Nanjing University is a great even. I am the chief editor of "Centenary Nanjing University", the next edition shall adopt it, this book is to be recorded in the university's history. (2)A special compound talent. Prof. Kang Yu-yi is of great attainments at stratigraphic paleontology, his painting is well grounded, a rare talent. (3)A high level monograph showing intersectant research of human art and natural science. This book contain theories, abundant knowledge, quite rich in geology, esthetics and painting knowledge. So it can act as an excellent cultural quality textbook of Nanjing University, this course should be given at Nanjing University. Without arts, synthetic university has no spirit; without human artistic edifying, natural scientist is not perfect. (4)A painting school. I propose to call it "Kang Painting School". Prof. Kang's painting is featured, I draw a summary: not only formally like, but vivacious. I hope that Artgeology strike root at Nanjing University and carry forward, ought to foster successor. Mr. Qu Qinyue, the former president of Nanjing University, speaks in writing --- "Exploring in Artistic Practice, Innovating in Arts-science Intercross --- Congratulations on the birth of 'Artgeology and Chinese Painting' in Nanjing University"( issue in another article). I have thoroughly explained my viewpoints in the "Preface", so I'll not repeat here. First, what must be emphasized about this book is, build a bridge between science and arts. As a scientist who write artistic history, painting historical works, Prof. Kang is the first person, this is to be emphasized particularly. Second, say something about the relation between geology and painting. The traditional landscape painting's many texturing methods are derived from the nature, we have seen many texturing methods just now when visit the geological specimen. The raindrop texturing is made by loess plateau's demorphism. I had gone to Fan Kuan's hometown --- Huayuan in Shanxi Province, the painting methods of bluffs, thickets on peaks in his paintings, can all be found on the loess plateau. Prof. Kang is not the first person who mention the relation between geology and arts, Wang Kewen had mentioned in "Landscape Painting Skills" the relation between landscape painting's texturing method and geology. Li Yincan from Taiwan talked about the raindrop texturing while mentioning Fan Kuan's "Travellers among brooks and mountains". Ni Yunlin's folding-zone texturing, is also found in geology. In Jiangsu Province, to analyse geological texturing, Prof. Kang is the first person, he had talked about the artgeological structure of Gong Xian's painting in 1988, that dissertation gave me a very deep impression. The orderly organization of the relation between geology and landscape painting's texturing method, is this book's gigantic contribution. In the Chinese painting historical theory, this is a book of contribution. I have been acquainted with Mr. Kang for a long time, this book had been sent to me really early, the pity is that I had been invited to Beijing to paint recently, so I have not read this book so far. This book is very significant. Landscape painters go out collecting information to the wilderness as well, but their observation is lopsided, and look only by sensation. It's rare to go so deep into the research of science and arts' relationship. This book, could only be written by Prof. Kang, other people can not do it , for he knows geology as well as painting, researches outdoors as well as ancients. Establishing a new branch by intercross of science and arts, as a inappropriate metaphor, horse hybridize donkey to make mule, the mule is stronger than both horse and donkey. Mr. Kang have put in lots of work at this point. Good conjunction of painting and the nature through the ages, shows that the anciets had living resources. If away from life, shutting the door to paint arbitrarily, one will not paint out the law. This book is a good knowledge introduction to landscape painters. I shall find some time later to read it carefully. Today we get together in one room, to celebrate the successfully publish of Kang's book. At the same time, his landscape paintings are displayed to us. Kang goes deep in teaching and academic research, I'm very excited. Kang is only 68-year old by now, just in the prime of life. He is a geologist as well as a Chinese painter, the sole two-titles, extremely strong in theory, there are few people like him in the world. Now let's say about "study the nature, get the heart fountain". Kang's teacher is Xu Gongze, Xu Gongze's teacher is Huang Junbi. Huang Junbi emphasizes on study on the nature, so it is evident that Kang's "study the nature" has it's source. This book's "Preface" has been well written, it's true. One thing is important, i.e. how to develop Chinese painting? how to innovate? We should insist on tradition, study the nature, to get heart fountain. So, the influence of Kang's theory should be expanded, to cause landscape painters come out of the "studying nature". Better figure out some means, to mix Kang's theory into the teaching of landscape painting. Looking at this book from research viewpoint, it is a fruit of academic intercross, and is a fruit of the innovation of arts theory. The common research on landscape painting, is not beyond:(1)from the humanism meaning; (2)from the native language of landscape painting. Whereas Prof. Kang is from a brand new aspect --- Artgology, it may be called "talk sky, talk earth", self contained as one system. The system's integrality, for there is no another similar book, can not be compared. Amidst Chinese painting, Why the landscape painting owns great influence? The reason for landscape painting to become the biggest painting branch in China, is that Chinese geological geomorphy is rich and varied, so as to cause Chinese painters fond of landscape esthetic. This answer has been gained from Prof. kang's book. I've written an article, printed and sent to everybody, for the sake of time, I'll not to repeat, just want to supplement one thing: the report by Prof. Kang just now is very wonderful, has found the root for several ancient masters' painting, has found the parents' home for a married woman. So, this book is very important, very significant. To "study the nature" is very important. Now someone paint with door shut, their painting can not be comprehended clearly even by themselves, the masses can not understand. The Jiangsu paiting school contributes greatly, which perfoms a 23,000-li scenery collect, to study the nature, openning up a new epoch. 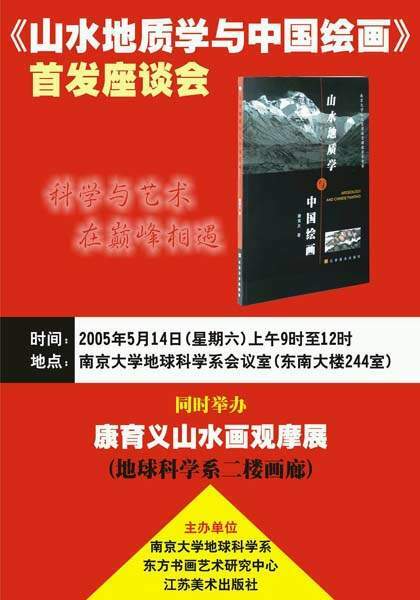 Prof. Kang's book, contributes a lot to the landscpe painting branch, fills up the blank. In the teaching of landscape painting, hope to start from Nanjing University, to use it. Hope Nanjing University to work on this aspect, and create a new world. This book is unprecedented! Will there be successors? I think to imitate Prof. Kang, becoming a geologist and landscape painter, is not easy. Chinese landscape painters should go deep into life, to appreciate in the nature. Shi Xi(Kun Can) lives in Mt Nushou for 60 years, his painting's texturing is just the ironstone at Mt Nushou. Ni Yunlin paints sedimentary rock aside Lake Tai, forming the folding-zone texturing. while Qian Songyan is painting, several rocks are placed on desk as model. Chinese painting take years to become a master, Prof. Kang is 68-year old by now, a master mature slowly. Often bring students out to sketch when teach landscape painting course, what we notice is the formal appearance, lacking of geological knowledge, can not explain it for students. Teacher Kang is good both at painting and geology, really difficult to come by. The teaching materials of this book I have read some once before, the formal publication this time distinguishes far from that original one. This book can act as professional textbook, it's a good book, very significant. I've never seen a book like this one, going deep to expound systematically landscape painting from scientific angle. So, I value it very much. I own the same teacher with Prof. Kang. This book, I admire very much. Even it's title is very attractive. "Conjunction of science and arts", really odd, usually been proposed by scientist, never a artist been seen to do that. Kang is undoubtedly a "artgeologist". His works can be recognized as painted by a geologist at the first glance, out of the ordinary. Mr Kang Yu-yi has several decades' teaching experience of geology, as well as long years landscape painting creation practice, "Artgeology and Chinese Painting", this book will add teaching material to Chinese painting, congratulations! Chinese landscape painting is the unique invention of the Chinese Nation. Ancient painters, by their farsighted wisdom and arduous artistic labour, explore and discover constantly, to form it's complete system and splendid artistic fruit, and become one gorgeous flower in the human painting arts treasure-house. Chinese painting emphasizes "study the nature, get the heart fountain", advocates plunging into the nature to apprehend the realm of "harmonic union of nature and human". Mr Kang Yu-yi, via eyes of a geologist, observe and analyse landscape's natural geological structure, summarizes it's law scientifically, with long-term landscape painting creation practical experience, present the former's abundant cognition and theory with Chinese painting brush and ink, has achieved plentiful and substantial artistic fruit. Writing paper upon this basis, publishing the monograph, "Artgeology and Chinese painting", there must be abundant content, which must can direct and inspire landscape painters engaged in professional creation, add to Chinese painting's "artistic science" a precious textbook, contribute pleasurably to landscape painting's development in the new era. In the middle of 1980s, Our Nanjing University adjusted the scientific research route, powerfully advocated branch intercross, push forward the united research across departments and branches. Since 1984, have set up successively research centers across departments and branches, such as oil and natural gas, ocean, environment science, life science, information science, material science, Chinese Ideologist Research Center, Orient Calligraphy and Painting Art Research Center and so on, building platforms to urge it. Orient Calligraphy and Painting Art Research Center is nominal, however, the university support forcefully, Mr Kuang, the honorary president, took up the post of director of the research center personally, appointed comrade Kang Yu-yi as the vice-director, to manage the daily works. The members of the research center come from scholars of every arts and science department who are fond of calligraphy and painting, the goal is to perform arts and science crossed research on the ancient Chinese calligraphy and painting, making use of Nanjing University's advantage of having a complete range of arts and science branches and abundant book and data, in the hope of big breakthrough of calligraphy and painting theory. Comrade Kang Yu-yi didn't let the masses down, he was firm and indomitable, despite of personal fame and gain, working hard, success prominently. Two years after the foundation of the research center, published his first science-arts monograph --- "An Album of Landscape Paintings of Tourism Resources in Guizhou". When I got this unique album in 1990, glad sincerely, and recommended this arts-science crossed fruit to the visiting brother colleges' learders. Four years later, I received comrade Kang Yu-yi's second science-arts monograph --- "A Collection of Kang Yu-yi’s Paintings of the Tourist Resources of Tekes". Another three years elapsed, the science-arts monograph, "Yongchun Fujian Province , A Scenic Spot for Tourism and Artgeology and Chinese Painting" formally published with more abundant and more comprehensive content. "Artgeology" is gradually formed and developed in long term repeated science-arts practice. In Sep 1997, comrade Kang Yu-yi gave the "Artgeology" course at the department of earth science for the first time, then engaged in teaching for several years, maturing gradually the "Artgeology". When I took over the teaching materials of "Artgeology and Chinese Painting" Which he sent to me, I was glad form him sincerely. The completion of this collegiate teaching material, marks the foundation of "Artgeological" frame and system. Now, the publication of "Artgeology and Chinese Painting" by Jiangsu Painting Publishing House, marks this new branch's birth in China. Finally, I want to talk about some idea, "Artgeology and Chinese Painting", this book is not born in arts college, but in Nanjing University, this may not be accidental. This proves the gigantic superiority of across branches research of Nanjing University. Proves the decision's correctness in the first place for the Orient Calligraphy and Painting Art Research Center to set up. Now, art branches are further developed, so as to the establishment of art academe. Even though, the department and branch across Orient Calligraphy and Painting Art Research Center is still irreplaceable. At the same time, I hope "Artgeology" will be inherited, keep up with the times, develop and improve continually, set out from Nanjing University, eradiate the whole country, act as a new theoretical basis of natural aesthetic and landscape painting creation, to push Chinese landscape arts forward. The Symposium for The First Issue of "Artgeology and Chinse Painting"
Prof. Kang is reporting his work. Prof. Tan Yong is making a speech. All attendees to the symposium.